A fun filled day for all age groups starts at this colorful sign at the entrance to the Manitoba Children's Museum in the City of Winnipeg. Twenty-two years ago in June of 1986, the Manitoba Children's Museum opened their doors to an incredible place where families can play and learn. The sign outside the museum shows off its colorful display of letters luring many tourists in for an exciting day. The museum covers an area of 4,000 square feet hosting three permanent exhibits, the Grain Elevator, Making Sense and the Big Top. You can find the Manitoba Children's Museum at The Forks which is in the centre of downtown Winnipeg and it is open daily with shorter hours during the Fall. Entrance to the Manitoba Children's Museum at The Forks, a National Historic Site in the City of Winnipeg, Manitoba, Canada. 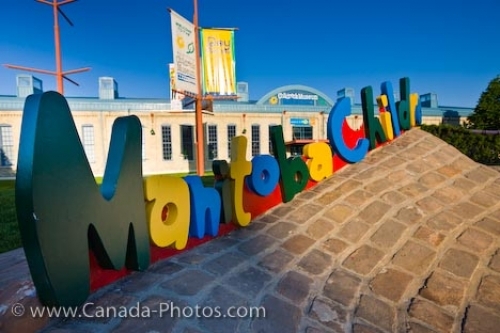 Picture of the colorful sign outside the Manitoba Children's Museum at the Forks in the City of Winnipeg, Manitoba.